Mark King has been a member of HSC since 2003 and upgraded to Life Member in 2005. He has served on the HSC Board of Directors since 2009, both as a Director (2009-2013) and Vice President (2013-2014). Mark served on the Grants Committee (2009-present) and was Grants Committee Chair 2012-2015. He was on the HSC Hunting with Heroes Committee from 2010 to 2011 and the Shoot for the Troops Tournament Committee from 2012 to 2013. Mark served as “Legacy” Convention Co-Chair with his wife Julianne in 2008, Convention Silent Auction Committee member (2007-2009, 2011-2012, 2014), auction donor and Annual Convention participant 2003-2014. 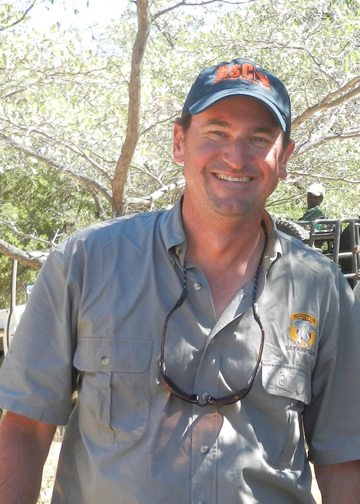 In addition to his work with HSC, he has been a Hunting Awards Sponsor (2008, 2011-2012, 2014) and a Gazelles Luncheon Sponsor (2011-2014). Mark is a member of SCI, SCI Houston and NRA. He is owner and principal of King Design Group, Inc., servicing the oil and gas industry since 1993. Mark is married to Julianne (HSC Life Member and Past President) and has 2 children: Grayson (17, HSC Member) and Sutton (13, HSC Member). © 2019 Houston Safari Club Foundation. All Rights Reserved. Houston Safari Club Foundation (HSCF) is a non-proﬁt organization, exempt from federal income tax, under section 501(c)(3) of the United States Internal Revenue Code. The charitable deduction for contributions to HSCF is the cash amount of the contribution, less the value of goods and services received, to the extent permitted by law. HSCF EIN 74-2177975. Please contact your tax advisor concerning deductibility of any payments as business deductions. HSCF is an independent organization, is not affiliated with Safari Club International (SCI) or its affiliates and is not a chapter or affiliate of any other organization.